Condition: Excellent gallery condition, framed and ready to hang. 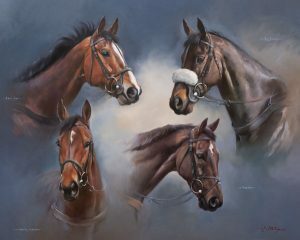 Jacqueline’s Stanhope’s reputation as one of the world’s finest equestrian and portrait artists conceals a broader fascination with the natural world and a lifelong love of animals. “I spent most of my childhood alone and filled my time drawing animals on any scrap of paper I could find. At eleven, I discovered oil paints and that was an epiphany. Nothing better captures their colour or texture. By the time I was in my teens I had taught myself to control this beautiful medium.” From her Durham studio Jacqueline balances the weight of prestigious international commissions with the freedom to paint creatively and informally. Jacqueline is entirely self-taught.